As we’ve discussed before, the world of medical device marketing as a whole is a few steps behind other industries when it comes to implementing digital marketing techniques. However, there are exceptions within the industry, and Medtronic illustrates how effective digital medical device marketing can be. Medtronic has gone the extra mile when it comes to creating and organizing web content: the company doesn’t rely on just one site, but supplements its primary company site with topic-specific sites such as MedtronicDiabetes.com and TamethePain.com. These secondary sites focus in one subject area, making them strong contenders for search engine rankings and inviting to patients and medical professionals seeking information in a specific area. Likewise, the company has set up a variety of blogs targeting different audiences. For example, The Loop offers tips on living with an insulin pump, personal stories and other information geared toward patients and families. On the other hand, within the medical professionals' section of the company's primary website, we find specifically-targeted professional information from Medtronic employees, such as Dale Moss's medical practice management blog. While the concept of multiple blogs targeting different audiences and providing niche-targeted content is strong, the implementation isn't as consistent or skillful as some of Medtronic's other efforts. The biggest problem is that the blogs aren't readily accessible from the company sites, missing a great opportunity to hook a site visitor into subscribing, sharing content or just bookmarking a blog to return. 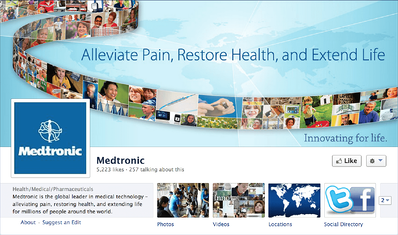 Medtronic is generating strong content here and should be making the most of it. Each Medtronic site contains substantial content. The content is optimized around relevant keywords, with each page featuring a unique, keyword-rich title and meta description. Internal links with keyword rich anchor text support core content pages. Medtronic’s primary site has more than 337,000 inbound links from a variety of sites, including medical companies, news sources and the company’s own related websites. The segmenting of content makes it easy for users to find what they’re looking for and to make contact with the company. The home page split-off of patient traffic from medical professional traffic ensures that each audience sees appropriate content, and focuses lead generation. Within the patient section, calls to action encourage the patient to speak with his or her doctor, and offer information to assist with that conversation. Premium content is offered in the form of eBooks, but because patients aren’t leads, no form completion is required to download that content. Everything is geared toward educating the patient and starting the conversation with his physician. In the medical professionals’ section, contact information is offered on nearly every page, and visitors are usually offered more than one option for making contact (for example, a telephone number for the division relevant to the page content and an email link). This could be further strengthened with contact forms directly on the page and premium content that required content information for access. Within the medical professionals’ section, visitors can read a variety of content ranging from information about conditions and treatment options to product-specific information—content for every stage of the sales cycle. In addition, formats are varied somewhat. For example, visitors can listen to a podcast on the site, and are offered a dial-in number for archived recordings. Further variation, such as on-site videos and infographics would strengthen the site. Medtronic has wholly embraced social media, and is working social networks in a way that exhibits an excellent understanding of the company’s varied audience. On Facebook, content is segmented much as it is among the sites; the Medtronic Facebook page is business-focused and has about 5,000 followers, while the Medtronic Diabetes page engages well over 100,000 users, many of whom are patients using the company’s equipment. The tone of that page is entirely different, inviting people to share personal milestones and responding to customer service issues. Likewise, the company has more than 20 Twitter accounts; the CEO Tweets, and additional accounts focus on corporate news, country-specific information, health-area-specific information and even job opportunities. The company’s LinkedIn page could be much more robust, but with thousands of employees working personal LinkedIn accounts it doesn’t seem that the network is being wholly neglected. 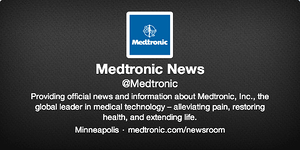 Medtronic makes frequent use of press releases, which serve multiple purposes. First, the releases are circulated to media outlets, not only generating publicity for the company and strengthening brand recognition, but also potentially generating inbound links from media outlets. Second, the company uses an online press release distribution service, meaning that the distribution service itself and its regular outlets provide inbound links. Finally, the releases are posted to the company website, further building the bank of content on the site and providing fresh, search engine optimized pages. Medtronic is just one company that's making digital marketing an effective part of its medical device marketing program. In upcoming posts, we'll look at others that are doing well, and that could improve their digital efforts. Overall grade? I'd give Medtronic a solid 'A', what would you give them? Who's doing it better? Weigh in in the comments.